Learn the warning signs of a heart attack - it may save your life or the life of someone you love. Magnetic so it can be placed in a prominent position in the home or workplace - eg. on the fridge or filing cabinet. Heart attacks are more common than you realise. We want every Australian to learn the warning signs of heart attack and call Triple Zero (000) if they, or someone else is experiencing any symptoms. 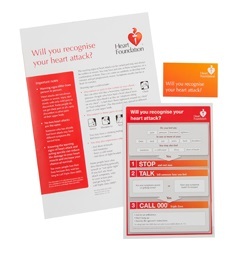 Make sure you recognise the warning signs of a heart attack, order your FREE action plan pack now. * 3 x warning signs action plan wallet cards (share with family or friends). * Maximum 5 packs per order.